A Ta Nei Temple plan or good local guide will be very helpful when visiting this site. This temple is located deep in the cambodian jungle and it is not easy to access to it. The floor plan illustrates a well ordered site but the reality is a ruinous temple with semi collapsed galleries. 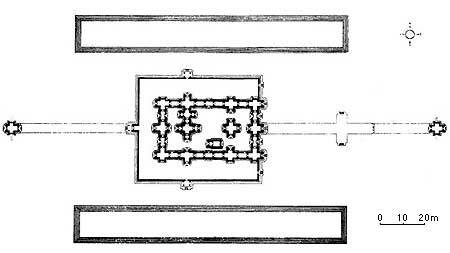 Ta Nei temple floor plan, courtesy of Maurice Glaize.